Japan saw a new version of the Silvia (S15) in 1999, now boasting 250 hp (184 kW) from itsSR20DET engine, thanks to a ball bearing turbocharger upgrade, as well as improved engine management. The SR20DE (non-turbo motor) featured only 165 hp (121 kW). The S15 Silvia included aggressive styling inside and out; upgrades to the chassis and suspension, including increased use of light alloy suspension components; and for the first time, a six-speed manual transmission (in addition to a 5-speed manual transmission and a four-speed automatic). Also for the first time, instead of a viscous limited slip differential, the S15 offered a more effective helical limited slip unit. The S15 Silvia model lineup was initially simplified to just the Spec-S (non-turbo) and Spec-R (turbo), both models offering an “Aero” variant with a large rear wing and mild ground effects. The Spec-R differed from previous Silvia models by featuring a 6-speed manual transmission. The Spec-R also included extensive chassis and suspension strengthening; via the use of anti-roll bars and strut bracing. The S15 featured the same 4-piston front brake calipers that were found in the S14 but included a larger brake booster. One of the major changes to the S15 model of the Silvia was the implementation of a helical limited slip differential to control rear wheel traction. The result was a safer, more track/fast-street driven Silvia; in some contrast to its drifting heritage. As with many Nissan’s, HICAS (High Capacity Active Steering) four wheel steering was available as an option. The Spec-S featured only a 5-speed manual transmission (in addition to a 4-speed automatic available on both the Spec-S and the Spec-R). It also lacked the additional chassis support of the Spec-R; featured 2-piston front brake caliper and a slightly smaller brake power booster. The Spec-S also only featured the viscous limited slip differential. 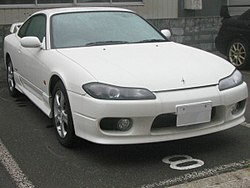 The line was later expanded to include various luxury and upgrade option packages for both the Spec-S and Spec-R. Autech, a specialty car developer, also offered several tuned versions of the S15; one with body and interior trim modeled after the Ferrari 456, called the style-A, available in both Spec-S and Spec-R based trims; and a second tuned version was based of the Spec-S trim level with the engine output increased to 200 hp (150 kW) through the use of increased compression, more aggressive camshafts, and free-breathing intake and exhaust tracts, along with ECU tuning and upgrades to the chassis and suspension. This version also included the 6-speed transmission and other upgrades normally found only in the Spec-R. There was also a convertible variant of the Silvia, called the Varietta, featuring a folding retractable hardtop. The Varietta was built by Autech and was based on the Spec-S model, featuring the same naturally aspirated engine, with a choice of the 4-speed automatic transmission or the 5-speed manual transmission. Production of the Silvia ended in August 2002 amidst Nissan’s efforts to reduce its myriad of platforms. Nissan’s sole sports car platform in the world is now the FM Platform, which underpins the current Fairlady Z marketed in the United States as the 350Z. The S-series’ claim to fame is that it is one of the world’s most popular drift cars, especially the S13 through S15 vehicles. It also has a long history in road racing. Its sister, the 240SX S13, was a multiple-time champion in the IMSA GTU series which its Silvia counterpart had a one make series in Japan. Silvias have been raced successfully in the JGTC and its predecessors. S110 and S12 Silvias also enjoyed limited success in rallying before AWD cars (including Nissan’s own Pulsar GTI-R) proceeded to dominate the sport. During the S13′s production, there was a one-make series in Japan. As of 2002, Nissan stopped producing the S platform with the S15-series Nissan Silvia being the final variant. In early September 2007, it was confirmed by a few unnamed Japanese magazines that Nissan is planning a new 4-cylinder, rear-wheel-drive, turbo sports coupe. Evidence of this confirmed report has been popping up all over the web with photos of what appears to be a test mule FM chassis that has been heavily chopped down and welded back together. The test mule FM chassis has been shortened quite a bit from a normal 350Z and resembles what appears to be a much smaller hatchback hybrid (this can be seen in the images on the doors, roofline, front bumper and bonnet). It is speculated that with the GTR being re-released into the market all over the world, with the absence of the Silvia for so long, and the run away success of Nissan’s FM chassis (the 350Z and G35/G37 and upcoming GTR) that the market place is ready once again for an affordable, turbo, rear drive sports car. The new iteration of the Silvia is rumored to be priced in a very affordable range of 21,000 to 23,000 USD and will be available as soon as 2010. As of June 2008, rumors have been abound about the future of the new Silvia. Toyota and Subaru have officially announced a new rear-wheel-drive sports coupe to be introduced to the Japanese, European and American markets starting in 2011 (in fact a new test mule Toyota/Subaru chassis has been seen running around a few tracks in Japan). The new platform will be priced between $20,000 – $23,000 USD. The new “Toybaru” coupe has yet to be named. A few days after the car’s official announcement, reports from various Japanese car enthusiast magazines reported that their inside sources at Nissan have said “Nissan is not sitting back and taking the new Toyota/Subaru sports coupe lightly. A new Silvia will be available on the market before the end of 2010 and will be priced in direct competition with the new Toyota/Subaru sports coupe.” The report went on to say “The new Silvia has in-fact been in development for over 3 years now and that it is being built on a modified FM platform.” The motor for the car was discussed in the reports as well sighting that either a new 1.8 litre or 2.0 litre turbo charged, rear-wheel-drive, 4 cylinder engine will be used (that outputs nearly 250hp). Again, nothing has been made official at this time, however, it is speculated heavily that the new Silvia platform resurrection will be officially announced within the next year at either the Tokyo Motor Show, LA Auto Show or Detroit Motor Show. At the 2008 Nissan360 conference, Infiniti of America confirmed that they are planning on releasing a brand new BMW 1-Series fighter by 2011 (this new car is to be slotted below the G35/G37 series as a entry level vehicle for Infiniti much like the old Infiniti G20 was). This announcement gives fuel to the new Silvia fire as from a marketing and financial standpoint, it would be very unprofitable of Nissan to build a brand new, compact, RWD car to compete directly with the BMW 1-series and not use the chassis in any other Nissan or Infiniti branded cars. Nissan had a glimpse of what the new 1-Series competitor would look like on hand in the form of a top-down view plastic mold of the car. The only definitive details the mold showed was the body lines, that the car was definitely smaller than the current Nissan 350Z/G37 and that it was looking to be a hatchback styled chassis. During Nissan’s GT2012 meeting held May 2008, a new side view image of the upcoming FR sports coupe due to go on sale in 2010 was briefly shown. The image reveals just enough information to give a good idea of what the final shape of the car will be and, going by similar images of the next generation Z12 Cube and Z34 Fairlady Z (370Z) which were also revealed at the meeting, Nissan isn’t going to let the new FR coupe loose without its own unique identity. Mechanical specifications for the new sports coupe include a 2 liter inline 4 cylinder engine using Nissan’s VCR (Variable Compression Ratio) technology and Nissan’s own VVEL system (similar to what is used in the VQ35HR and VQ37HR engines found in the 350Z/370Z/G37 Platforms.) Power is still rumored to be 250hp with 215lbs of torque to move the 2900lbs coupe around. The FR sports coupe will position itself at the bottom of Nissan’s performance car tree, being the cheapest in price but offering a more sports orientated driving experience compared to the more expensive G37 Sports Coupe. Once the new entry level FR sports coupe is released, it will emphasize Nissan’s performance car range as one which is well defined and offers plenty of choices, which is in complete contrast to earlier on in the decade. Nissan’s 2.0L FR sports coupe is still expected to sell at around 2,500,000 yen.